Self-Taking Camera Stand, 180-degree rotation, easy adjusts to any angel. Hassle-free solution to narrow lens or self-taken photography. Note: If your phone cannot use this well, please download the software “Camera360”, then open the camera settings of the software, set the function of volume keys to take Photographs. 1. The Phone Holder: only suit for width in the range of 5.8~8.8 cm. 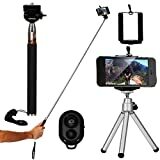 This entry was posted in Discount Photography and tagged 4in1, Black, Control, DC494, Holder, Monopod, Remote, Selfie, Tripod, XCSOURCE® by Ball Photo. Bookmark the permalink.